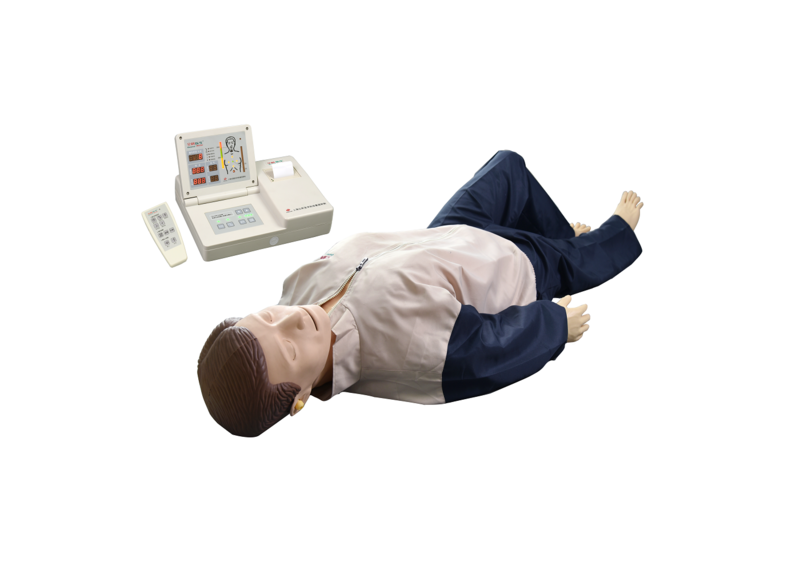 3) Mode III: Actual assessment, during the setting period, complete the pre-set assessment standard according to the 2010 international CPR standard; teachers can set operating time, cycle number, compression and inflation ratio, correct compression no., correct inflation no., and the accuracy rate of compression and inflation. 3. The content of result sheet covers operation mode, consciousness judgment, emergency call, pulse examination, breath examination, foreign body clearance, inflation and compression number every operation cycle, correct/wrong compression , reason for wrong compression ,correct/wrong inflation , reason for incorrect inflation, time setting, operation time, assessment evaluation. RF remote controller: teacher can control CPR operation, pupil changes, pulse activity, print and other functions by using remote controller; can also record conscious judgment, emergency call, pulse examination, breath examination, and foreign body clearance. The model is molded under high temperature by means of stainless mould, with face skin, neck skin, chest skin and hair made of imported material. It features durability, non-deformation and easy assembly and disassembly.